I've mentioned briefly over on instagram that I recently purchased my first home with my boyfriend, Kurt. After college, I moved back home to save money for a few years while I worked, with the goal of buying my own place much before I turned 30. The time has finally come, and it still sounds strange to say the words "homeowner" without feeling like I am playing house as a little kid...but it also feels like it was the right time. We (with some handy help from family) have been spending a lot of time over the past few weeks getting the new place set up and feeling like home. It's definitely a daunting process coming from your parents home; you almost don't realize just how much you need to fill a space. We chose to buy a townhome because we are both busy with work and wanted an easier transition before having the full-on maintenance of a house with more property to care for, and even still, it's going to be a journey getting everything set up the way we'd like it to be. Our place is relatively new, so there luckily aren't too many necessary changes that need to be made; just cosmetic updates to make the space suit our taste. Let's just say it's going to be a busy next few weeks as we paint and begin making some updates now that we are moved in with all of our furniture. In the meantime, there have been a few key tricks I've learned about how to make a place feel truly like home. 1) Make Small, But Impactful Changes to the Spaces You Use Most, First. This was important to me, because as someone who is quite impatient when it comes to things like this, I knew I couldn't feel completely at home until I rid the space of some elements that didn't at all suit my style. For us, that meant removing unsightly lighting fixtures and adding touches that made things feel personal. 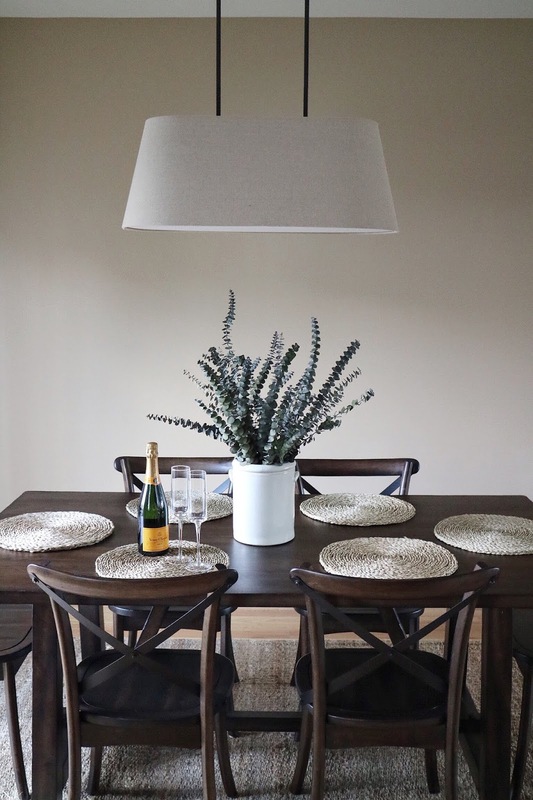 For example, we were able to instantly give the whole main floor a facelift by adding a new West Elm light above our dining room table, along with some Water Hyacinth placemats, and a Terrain planter filled with fragrant Eucalyptus. Oh...and a bottle of celebratory champagne never hurts either 😉. I've always felt as though scent has a great impact on how a space makes you feel. Growing up, my house always smelled like fresh laundry and flowers from the garden, and it's something I'd miss when I left for vacation or school. Of course, when you move into a new space, it's missing that familiar smell that really makes it feel like your own. One of the first things I did when I got the keys to my new place was set up my diffusers and light a few candles, and I can't tell you what a difference it made to the space. 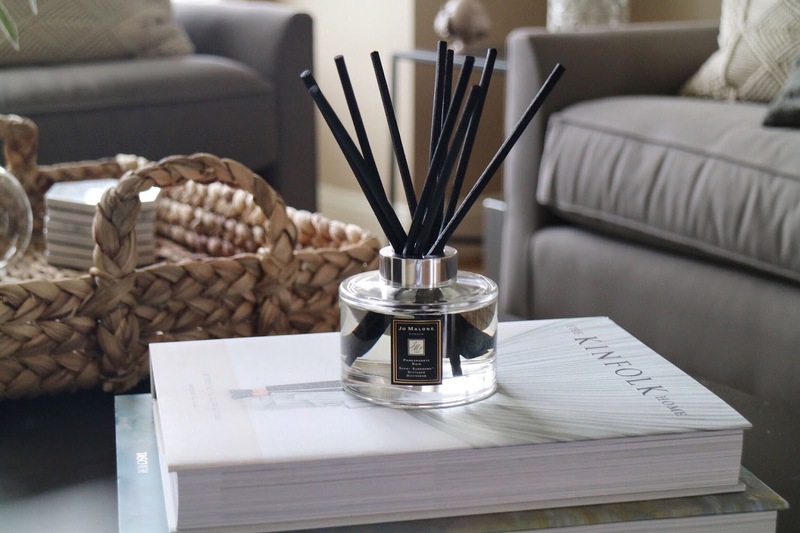 Scent manages to create a relaxing environment that feels cleaner and more personal, and I've absolutely felt that way about my living room space since I began using the Jo Malone London Pomegranate Noir Scent Surround Diffuser. 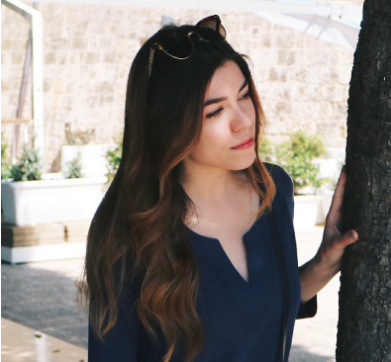 I've always been a fan of the fragrance on the skin, but I feel that in the home, you can really detect that perfect balance between the warmth of the spicy wood notes, floral from Casablanca lilies, and freshness from pomegranate and pink pepper. 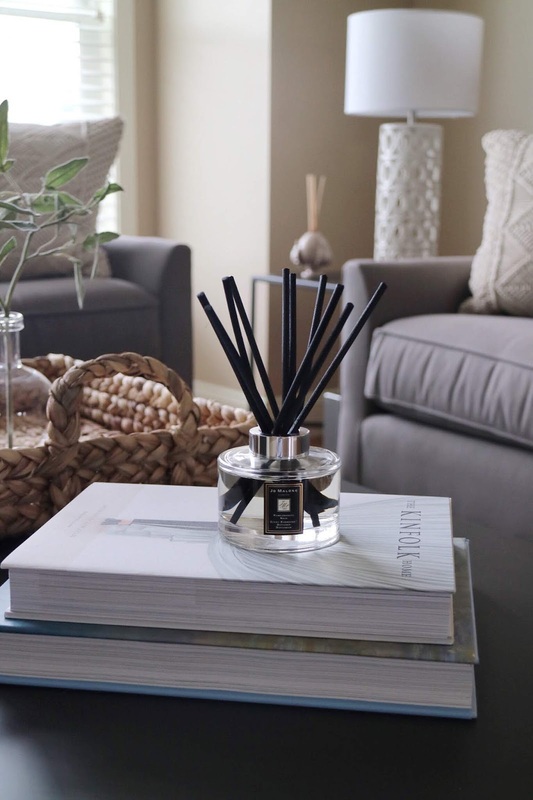 This diffuser also manages to envelop a space with the perfect amount of strength; I love that I can smell hints of it whether I am walking by briefly or sitting on the couch closer to it, without it ever being cloying. I also feel that the packaging offers a beautifully sleek look to spaces, adding a luxurious touch to your space. I now look forward to the familiarity of the scent when I get home after a long day. 3) Choose Your "Signature" Color Palette. Choosing a color palette is a great way to get started designing your new space, especially if, like me, you didn't have a lot to work with yet. 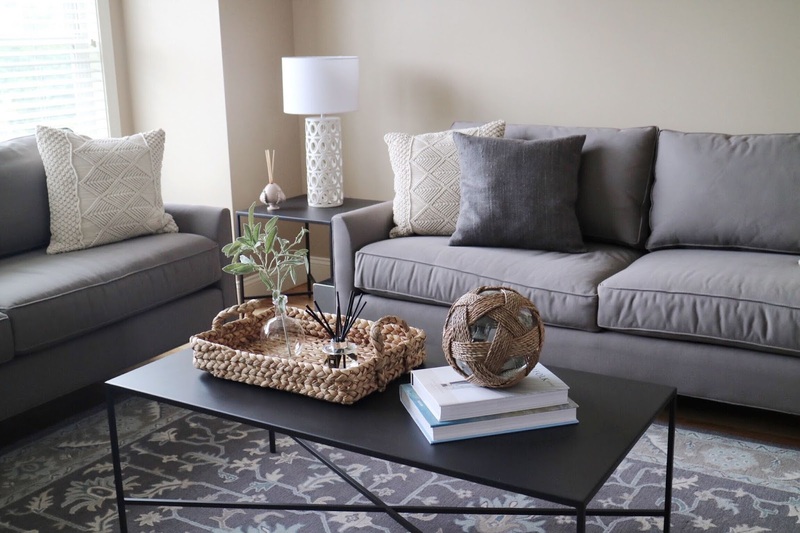 I chose to use gray as my main color, with aqua as an accent (in small doses), and then added natural and neutral touches from rattan, iron, dark wood, and woven cream fabrics. I find this to be a foolproof way to choose items for your space, and it helps to tie everything together, especially because I don't own a super large house that I feel can be separated out into many different styles, and still work. To me, this palette has become an aspect of the space that makes it feel much more like my own, and sort of creates a signature look. Opening our new space to our friends and family has been a really great way to make it feel like home. Because, after all, it is the people who bring the personality and help to create new memories in your new home. 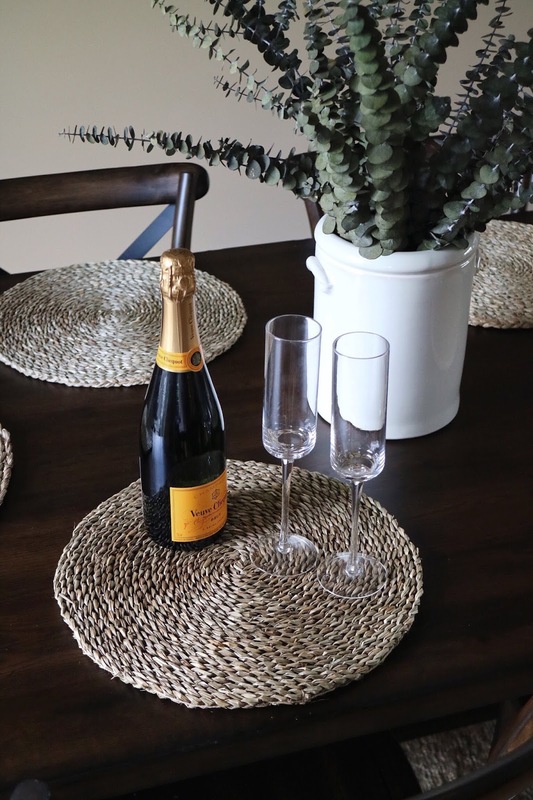 Always have a bottle of wine or champagne chilled so that you're ready for guests at any given moment. Having this mindset also gives you a reason to make sure your space doesn't ever get messy; you'll always want it to look presentable! I can't wait to share more of the new space with you as we update and make it truly our own. Let me know if you'd like to see before and after photos as we go along, and don't forget to share the ways you make a house feel like a home as well.